The Riverboat Stompers steam into the Caribbean with JazzSea Cruises. Steve Straus cl, Jimmy Mazzy bj, Phil Hower p, Neil Flewelling c, Stu Gunn tba, Frank Batchelor tb, and Rich Malcolm d.
The Riverboat Stompers featuring Jimmy Mazzy is one of the four trad jazz bands performing on JazzSea Cruises’ two-week tour of the Southern Caribbean on Holland America Lines. The cruise departs Ft. Lauderdale on January, 5, 2018. Also included are the Bob Schulz Frisco Jazz Band, New Orleans Nighthawks, and Grand Dominion. Jammer and Banjos Aweigh programs are conducted for musician passengers. 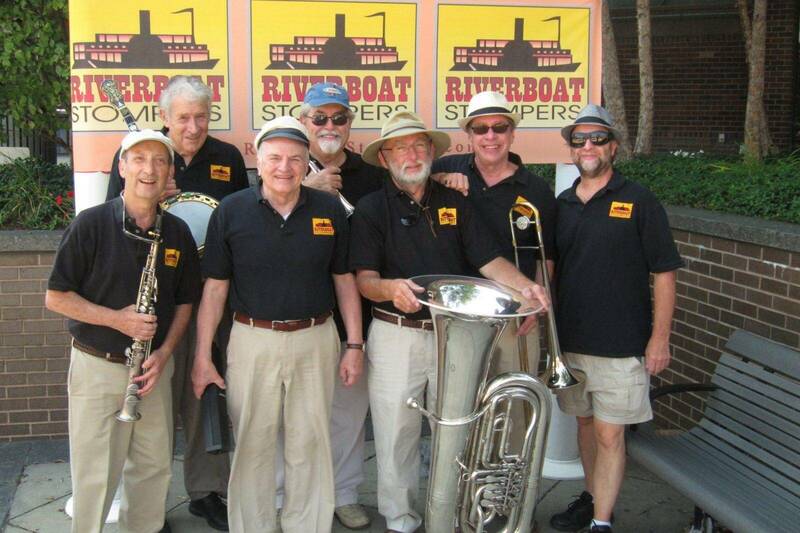 The Riverboat Stompers took form in the mid-1990’s as a seven-piece band. Four of the founding members are still performing. The group is known around New England for lively delivery of tunes and humorous vocals. The addition of highly-regarded Jimmy Mazzy on banjo and vocals has greatly contributed to the band’s performance quality and audience appeal. The sailing will enable a reunion of three members of The Dartmouth Five, the last of several trad bands to originate out of Dartmouth College. Steve Straus, clarinet, Frank Batchelor, trombone, and Scott Anthony, banjo, dove into Dixieland-style music back in the late ’60s. One of their gigs involved accompanying the George Romney presidential campaign throughout New Hampshire. Otherwise gigs usually were at Vermont ski areas or college events. Steve and Frank today play in the Riverboat Stompers while Scott has long worked with Bob Schulz. Scott found early notoriety as the intermission performer over eight years at Turk Murphy’s club, Earthquake McGoon’s.